The biggest failing of Apple’s iTunes Match is its 25,000-track limit. (It has others, to be sure.) Apple gives you no control over which tracks you store in the cloud, nor does it offer an option to pay more for additional storage. If you’re a music fan with a large library, you have to perform a frustrating dance to create a secondary iTunes library, or simply remove items from your main library, to get under the limit. “Who needs more than 25,000 tracks?” you wonder. “That’s only for pirates!” you say. I happen to have a music collection amassed over 25-plus years. I buy classical music compilations with hundreds of tracks for a few bucks. I get two free concert downloads a week with my Concert Vault subscription. I’ve purchased, traded, and/or downloaded thousands of live shows from places such as the Internet Archive’s Live Music Archive and band websites. 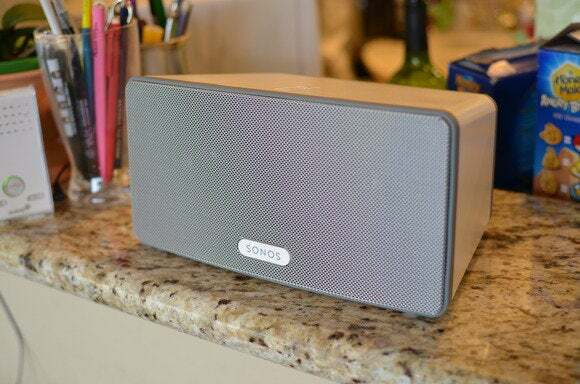 Sonos lets me listen to my nearly 40,000 Cloud Player songs. In short, if you love music, these days you can easily have a lot of it—which makes the fact that Amazon’s service is a mess that much more disappointing. Here are four problems the House of Bezos really needs to address to make its Web version of Cloud Player (available on any computer and the only option for Mac users) worth its salt. Adobe AIR app? Yuck, try again. When you finally get it going, using the importer is frustratingly slow. It can scan your iTunes or Windows Media Player libraries and start the upload/match process with all your content, but when you want to add anything new, your best bet is to choose the Browse manually option and select a folder (which can contain subfolders) to upload. Even if you have only one album, the app takes several minutes to get to the point of being able to upload it. And when the app refuses to upload something—I tried again and again to add the remastered version of Sgt. Pepper’s Lonely Hearts Club Band, but the uploader didn’t think it was any different from my original CD—you’re out of luck. Getting your music into the cloud shouldn’t be one of the most frustrating parts of using an online service. One the best parts about this and similar services is that they can not only save you time and bandwidth by matching songs in your library with theirs (obviating the need to upload them), but also provide you with potentially higher-quality versions than, say, your decade-old CD rips. Matching is great, but only if you can tell when it has happened. The big problem here is that you have no easy way to see which tracks have been matched or upgraded. With iTunes you can create a smart playlist to show these files. 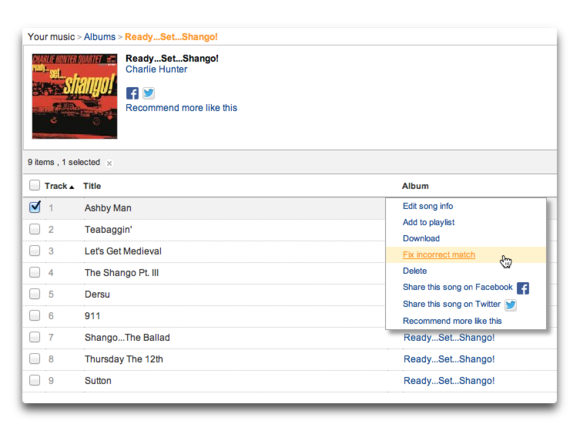 With Cloud Player, you have to examine each track, click the little triangle next to it, and look for the words Fix incorrect match—your only indication that a song has been matched in the first place. Cloud Player needs a built-in playlist that shows such songs. As of this writing, my Cloud Player account has 39,736 items. Quite a few of them are duplicates. When I was putting all my content into the Amazon cloud, I uploaded from a few different computers—and apparently that was enough to confuse the service to point where I now have three copies of some tracks. And Cloud Player does nothing to help me find them. Many too many: a study in duplicates. Amazon’s suggestion is to sort all song titles from A to Z, find the duplicates yourself, and then delete the ones you don’t want. That’s crazy. Cloud Player needs to be a lot more helpful, even if it only creates a playlist that displays songs with the same name, album, artist, and duration. Speaking of playlists, I’ve found Cloud Player’s hard to use and not all that useful. You can create a playlist and drag and drop songs to it, but you’re limited to 500 tracks. And unless you’ve properly sorted tracks before adding them to a playlist (no easy task in Amazon’s confusing Web interface), you end up with songs out of order and no easy way to fix them. 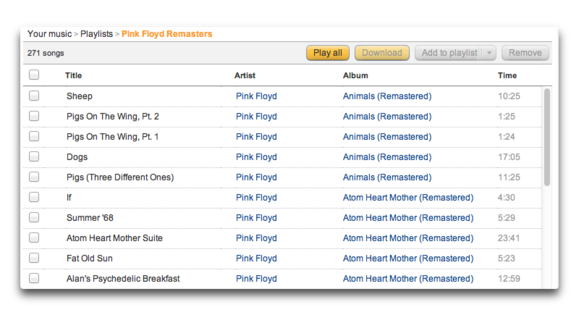 For example, I put all the remastered Pink Floyd albums into a playlist by searching for (Remastered) in Albums, sorting by artist, and then dragging the tracks to the playlist. Even with proper song-number tagging, albums such as The Wall and The Dark Side of the Moon are out of order. These songs are out of order, and fixing it in a playlist just ain’t easy. 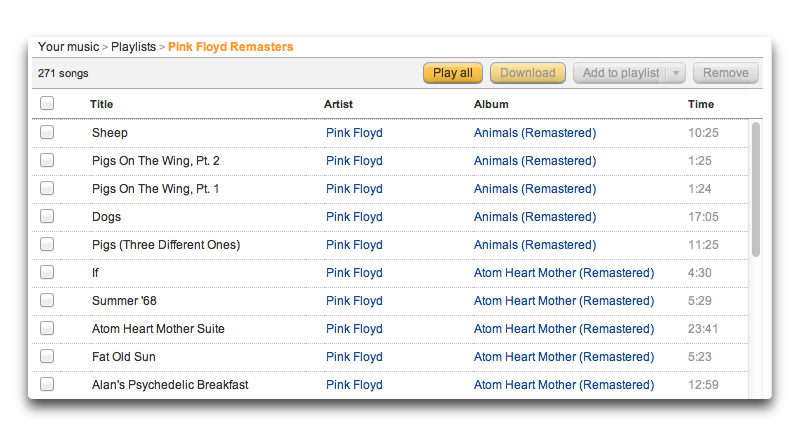 Amazon could alleviate these problems if it offered easy ways to move or reorder items within playlists. Although you can drag and drop songs within a playlist to other positions, you can’t view track numbers to understand where things should be, you can’t easily tell whether a song will be moved to before or after a highlighted track as you hover over it, and the interface redraws itself after every move (making it difficult to see what just happened, and with no way to undo the action). Making matters worse, the headers that you can use to sort outside of playlists (title, artist, album, time) do absolutely nothing within playlists. Come on, Amazon, playlists are vital for large libraries, so put some effort into them! I may not listen to most of the music in my collection on a regular basis, but I treat Cloud Player additionally as an online backup of my collection (similar to how I view Flickr as an offsite backup for my best and most important digital photos). 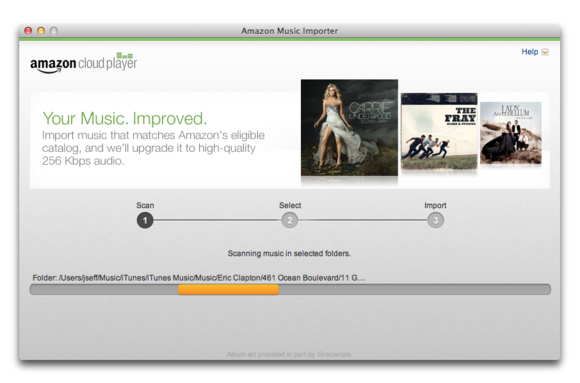 Like iTunes Match, Cloud Player now matches up songs in its database with your library, accelerating the upload process and providing you with 256-kbps MP3 versions of those files that you can download as potential upgrades to your existing tracks. And considering the playback support on my computers, iOS devices, and Sonos hardware, the fee for Cloud Player Premium is easy to swallow. But for the service to be truly useful, Amazon has its work cut out for it in terms of improving the user experience. 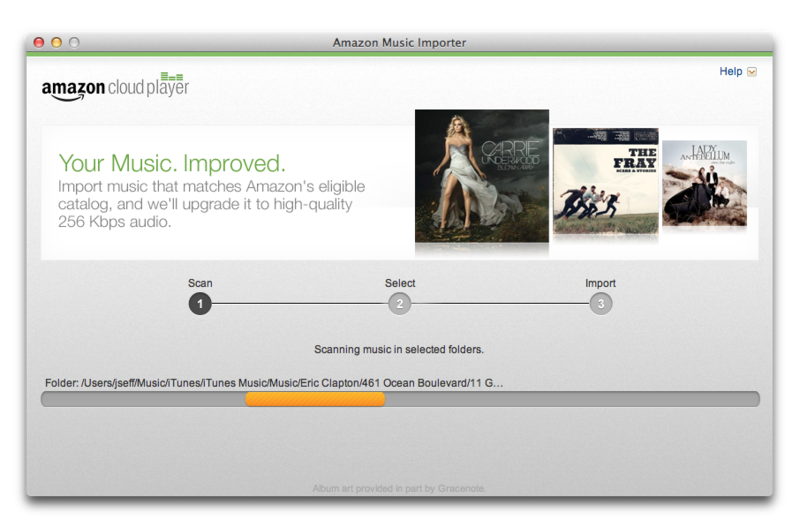 If Amazon fixes these issues, it would make me—and, I suspect, many other people—a happy musical camper.